REGO-FIX's new line of toolholder vises uses roller bearing locking technology to provide a safe, secure and tight grip on the holder without fear of slipping. The roller bearings act as a cam lock and tighten as the holder is rotated in either direction. These vises are ideal for tightening or loosening various tooling, including nuts, pull studs and arbors. In most cases, the holders can be placed in the vise upside down for mounting pull studs or coolant tubes, as required. The vises are compatible with REGO PLUS products, which are compatible with all BIG PLUS spindles and include a full line of ER and powRgrip system toolholders. These products offer several advantages to manufacturers working with high precision milling machines equipped with the BIG PLUS system, including better TIR, improved tool rigidity, increased quality of surface finishes and higher machine accuracies. REGO PLUS products also work with form B coolant and accommodate through-the-taper coolant as a standard feature. Perfect for the aerospace, automotive, medical and watch industries, the REGO-FIX slim-nose powRgrip 6 toolholder, or PG6, has a minimal outside diameter of 0.4" (10 mm), as well as a clamping diameter ranging from 0.008" to 0.125" (0.2 mm to 3.175 mm). Because of its small, slim design, the PG6 provides less tool interference, easily machines tight pockets and delivers high levels of productivity. Furthermore, the PG6 has a runout accuracy of <3 um and provides quick, simple and safe tool changes. When paired with the company's expanded line of HSK 40 E holders, the PG6 further enhances the capabilities of the company's existing powRgrip toolholding system, which offers better TIR, improved tool dampening, easy presetting, longer tool life and unparalleled clamping forces. 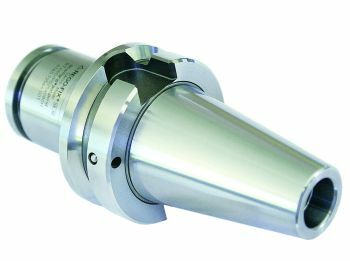 Additionally, the toolholding system is ideal for high speed machining applications, and offers an extensive taper selection, including CAT, BT, HSK and TC versions. All powRgrip toolholders are balanced by design, improving part quality and surface finish, and lowering manufacturing costs.